AllTray – Minimize any program into the system tray | God, Your Book Is Great !! AllTray is a very useful Linux utility that many are not aware of. The problem it solves is this : Many a time, the Linux application (Eg Thunderbird, Subscription, Gedit) that you use may not have a tray icon. This means when you click on the application’s close button , the application is terminated. This is in contrast to some other applications like Pidgin, Empathy , Rhythmbox and others which gets minimized to system tray and stay in the background when you click on the close button. AllTray is a Linux utility that can make any Linux application to get minimized in the system tray (and not get terminated) when you press the close icon. An alternate way to say the same thing is that , AllTray allows you to “dock” any application, although it looks more like a Mac lingo. If you are in any other Linux variant, then you can go to AllTray’s homepage and get the source code and install it yourself. The most common way to use AllTray is using its GUI. So start any application that you want to be minimized. Then start AllTray from Applications -> Accessories -> AllTray. You will get a small dialog box which says “Please click on the window you would like to dock ” and a “Cancel” button . The mouse pointer also changes to a “+” sign. Now click on the title bar of the application that you want to minimize (or dock). The application now moves to system tray and it is immediately minimized. Now you can click on the icon at the system tray to maximize/minimize the application. If you want to permanently close it , then right click on the application and select “Exit” . If you want to remove AllTray’s behavior (ie make the application behave conventionally) then right click on the tray icon and select “Undock”. The application will now be maximized, the icon is removed from system tray and if you now click on the close button , then the application is truly terminated. I really like the fact that AllTray also works well from the console and it has more options when you invoke from the console. You can try “alltray –help” to get all the options. This makes allTray run in console’s foreground. If you want to make it run in the background , append an “&” to the command. The side effect is that if you close the console , the application gets terminated. Sometimes, you might want to move an existing application to be docked. AllTray currently does not have any functionality from console to do that. (previously it had a -p pid option). So in this case, it is easier to do it using the GUI. (Refer the steps for GUI above). In this case, Thunderbird starts out minimized and I can press Alt+t to maximize it whenever I want. Pressing it again, minimizes it. I was not able to assign it a shortcut using the super key (ie Windows key) like super + t . This was because Super was not an acceptable modifier – I was able to assign shortcuts like Alt+Super(windows) though. For more details check alltray –help. So , when the system starts, it starts both Sunbird and Thunderbird. Sunbird is immediately minimized and I can use Alt+s to maximize/minimize it. Thunderbird starts out in a maximized form (and does not dock immediately). 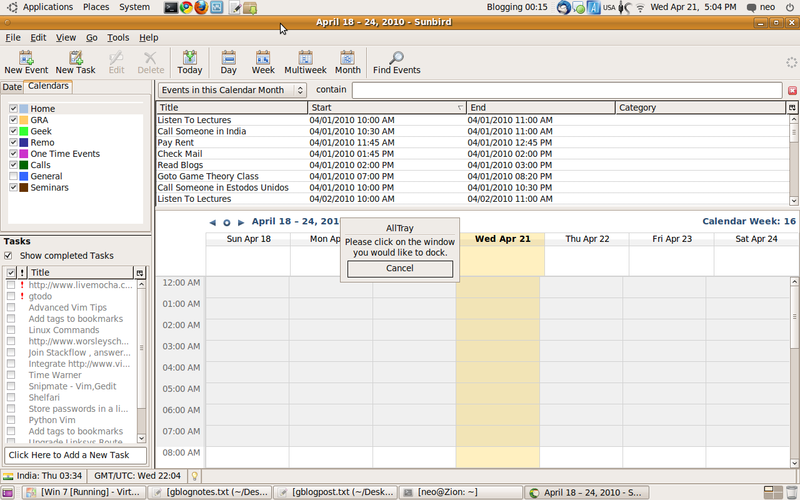 I can check the emails and then click on the close button and it will get minimized to system tray. I can use Alt+t to control minimizing/maximizing Thunderbird. AllTray is a neat utility and I hope it is useful for you ! I just read your post with great interest. I also use alltray and thunderbird. I added in the Ubuntu boot the line “alltray thunderbird” (I do not want to be maximized at startup). If you have an idea, I take ! I think “usr/bin/alltray /usr/bin/thunderbird -k Alt:t” by itself will start the app in minimized form . The -s switch in the example I gave had the effect of “showing” the application. I am not sure how to use docks to maximize/minimze. It doesn’t work with Chromium though, unless you right click and tick ‘use system title bar and borders’.